柴宜弘 (1998年10月). バルカン史 - 世界各国史. 日本、東京: 山川出版社. ISBN 978-4634414808. エドガー・ヘッシュ、訳:佐久間穆 (1995年5月). バルカン半島. 日本、東京: みすず書房. ISBN 978-4622033677. ^ History of the municipal theatre Archived 2008年2月4日, at the Wayback Machine. from Corfu city hall Quote: "The Municipal Theatre was not only an Art-monument but also a historical one. 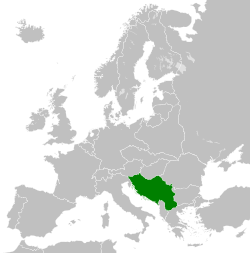 On its premises the exiled Serbian parliament, the Skoupsina, held up meetings in 1916, which decided the creation of the new Unified Kingdom of Yugoslavia."